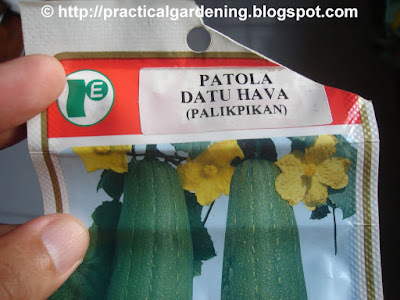 Our patola or luffa is now ready for harvesting. It seems still a bit young though since you'll notice that the top part hasn't been "filled-up" yet. The plant grew on the backyard garden trellis. This is how it looked just 4 days ago. Here's the seed packet that we bought from Ace hardware. You'll notice immediately that the luffa pictured is not what we got. Apparently, a sticker label (Datu Hava - Palikpikan) was placed to cover the label underneath (Prado Ace). Palikpikan roughly means "winged" and the actual fruit does have ridges or "wings" along the length.